If you’re one of the millions of Americans who have lost teeth through misadventure, health concerns, or poor oral hygiene, you know how much of a difference just one tooth can make. Every aspect of our lives is affected by our smile, including our advancement in our careers, our feelings of self-confidence, and our social lives. If your smile has gaps in it there are solutions available that will restore your smile through the magic of dental implants. Don’t let missing teeth impact your life, talk to your dentist about dental implants today. They’re an amazing way to give you a natural-looking smile with prosthetic teeth made from durable materials with a natural look. Getting implants involves the placement of mounting points in holes drilled in your jaw, on which is placed an abutment. 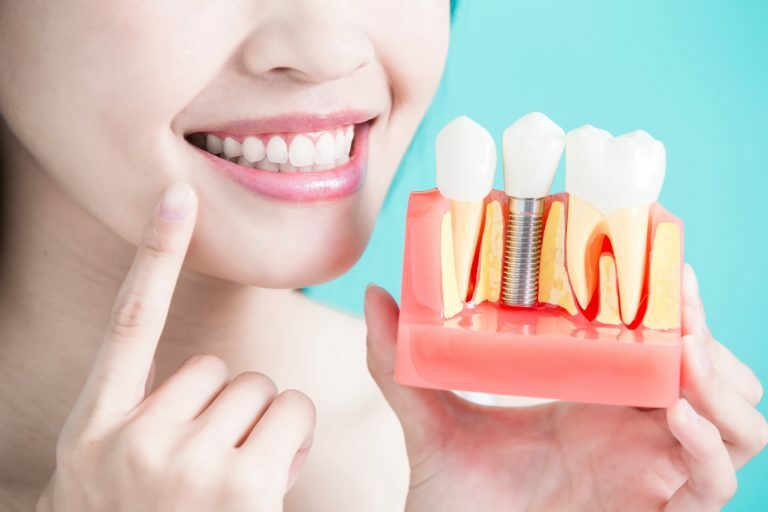 Abutments are connectors that allow the dentist to place the replacement tooth on the titanium mounting point placed in your jaw. Modern dental implants are built on the back of techniques going back over hundreds of years, but current methods have only been around for 30 years or so. Their effectiveness makes them the preferred method of treating patients with missing teeth thanks to the ability of implants to help maintain jaw density and restore natural speech and eating ability. Innovations in the technology have also rendered it one of the safest forms of dental surgery you can get. Is There Anything I Need To Know About Dental Implants? As we mentioned above dental implants have been used for over a thousand years, with the earliest occurrence happening in 600 AD. Modern technology has improved on the techniques used in history and come up with a method that is safe, comfortable, and nearly impossible to tell from natural teeth. Below we have some other interesting implant facts! Mayan Shells – The earliest form of implants involved pounding sea-shells into the jaw of those missing teeth. These implants actually showed some degree of remodeling, or healing, meaning that the body was growing around them and securing them in place. Encourages Jawbone Health – Implants have the distinction of being the only prosthetic solution that actually helps stimulate the growth of the jawbone. AAID – The American Academy of Implant Dentistry was created in 1951 to help promote the research, development, and regulation of implants and the science of implantology. The Modern Progenitor – P.I. Branemark is credited with discovering that fuse naturally with living bone, stimulating its use in dental implants, knee, and hip replacements. Millions of Implantees – There are millions of people who have received dental implants in the US today, 3 million at last count. Half a million new denture patients join them every year. Don’t let your vision of the future include hiding your smile and being embarrassed about the state of your teeth. Make a call to Dr. Alireza Movassaghi at the Alvarado Family Dental Center in Los Angeles, CA. A future with a bright and beautiful smile can be yours, just schedule your consultation and see what Dr. Movassaghi can do for you!